Silicon Systems allow you to enhance your productivity using top-quality Solid State Drives (SSDs). Silicon Systems manufacture a comprehensive line of storage units engineered to optimize your data needs. Silicon Systems started manufacturing storage units in 2004. Initially, it was manufacturing PATA and SATA hard drives for the users. More recently, however, it began manufacturing SSD drives seeing the increasing demand. The company manufactures SSDs for enterprises, home desktop, and laptop users. 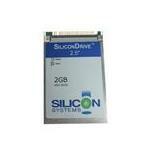 Internal Solid State Disk Drives by Silicon Systems provide about 128GB to 2TB disk space. These semiconductor-based storage units have almost the same space as that of a hard drive but are comparatively faster. Moreover, SSD disk drives can boot your system in about 1/3rd the time taken by a HDD. Buy Silicon Systems Solid State Disk Drives for your business machines from Memory4Less.com to avail exceptional support and free ground shipping.